Sunset aerobics classes on the promenade overlooking Mekong River are just one of the surprises we found on our adventure in Vientiane, Laos. At 4,000 kip (about 50 US cents) it was quite a bargain. The students here were a good mix of locals, expats, and travelers. Once considered a backwater, Vientiane is rapidly evolving into one of Asia’s most charming and laid back capital cities. 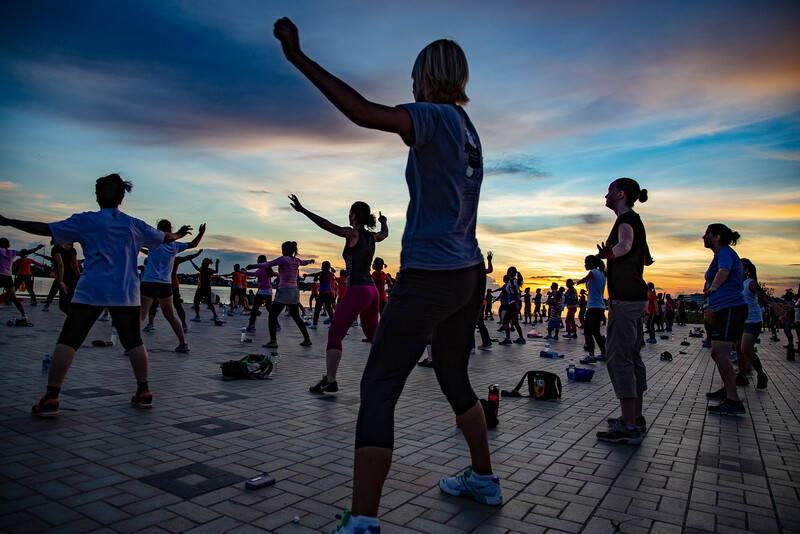 Great shot Jon – I used to love watching the exercise groups in the morning and again at twilight in Phnom Penh on the waterfront. Thanks Maria. I didn’t really know what to expect from Vientiane but it is an amazing place. Kind of like Phnom Penh but the pace is slower and everything seems more accessible. Looking forward to more time there.